While I was in prayer this morning…I got a group hug from God, Jesus and the Holy Spirit. They hugged me!!! They surrounded me. I was in the middle. I felt so loved and protected. I felt each one of their love for me individually and then I felt one God in three persons at the same time. I have a relationship with all three persons in the trinity and throughout my life they have been there for me!!! Each one is so powerful in what they do in my life and who they are!!! But at the same time I know they are God. God is the most unique being in the entire universe!!! He is one God in three persons. It’s hard to wrap your mind around our unique God and it’s taken me years to develop a relationship with each person in the trinity…but I know them…I know Him. I know Him because of the bible. I know Him because of my prayer life. I know Him from being taught as a child and then from my experiences from salvation and through trials. I know Him through the many victories I’ve experienced. I know him from the love and joys I feel from Him. I know Him through my praise and worship of Him! I know Him because of the Holy Spirit in me. I’ve written this message straight from my prayer closet. This blog comes from todays prayer and worship flowing with good sanctifying tears. I love the Lord so so so so much and my prayer is that everyone will take in the unique experiences that we are allowed to have with the greatest and most power being in the universe…THE …”I AM”….God!!!!! 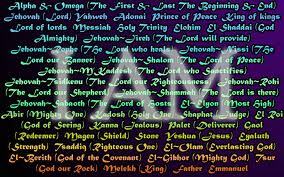 The Names of God… Helps Us to Know Him! Psalms 9:9,10 9 The LORD is a refuge for the oppressed, a stronghold in times of trouble. 10 Those who know your name trust in you, for you, LORD, have never forsaken those who seek you. What is your name? This question has been asked of you for as long as you can remember. Your name is very important…so important that we have a paper that verifies our identity (birth certificate) and also a driver’s license. If you don’t have some form of identification in this world you can’t go anywhere or do anything. If someone mentions a person’s name you know the first thing that happens to you is you try to get a mental picture of that person. You immediately try to identify them in your mind. If you don’t remember that person right away…the person who mentioned the name will begin to tell you things about them until you go…..oh yeah…I know them. 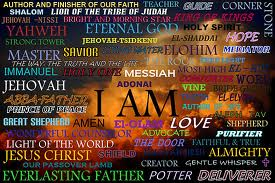 Please take some time to read and study the names of God. Why is this so important? 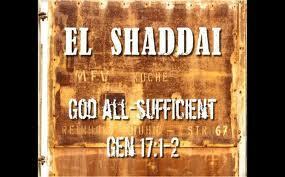 His names tell you who He is and they reveal His character, attributes and abilities. It Helps us to identify His personality and when we understand who He is in this way we began to know Him in a very personal way. This is His way of helping us to get close to Him our God who we can’t see…but can get to know. If we spend time just meditating on His name alone…..this will have a big effect getting to know Him better. I feel God is saying to us that He is it!! There is nothing in front of Him and nothing in back of Him. There is no existence of any other being that has control of the any created things. There is no existence of any life or anything before Him or after Him….He is it, He is all, and He is…PERIOD!….don’t even think about it…don’t even go there!….He is!…That’s it! He has another name that also states this in Revelation 21:1-8…..He says…”I AM ALPHA AND OMEGA”…which means…beginning and end. When the disciples asked Jesus how to pray in Mathew 6 He told them this important way to address God…. Our Father which art in heaven, Hallowed be thy name. What does this mean? How do we hollow God’s name? 1. I respect the name of God. 2. I believe in His identity. 3. I’m obedient to His name. 4. I acknowledge God’s Holiness. 5. His name is glorified in my heart in the form of my worship to Him. 6. I live my life to reflect His name. 7. I give honor His name. 8. I fear the name of Lord. 9. I worship the ground God walks on (this means-I love Him with my whole heart). 10. I submit to God as the head of my life and have no other gods before me. Names have an important place and meaning in our lives and one of the most important name that we should be focused on, memorizing, and meditating on is the names of our God. Message for today: Know the names of God and you will have a more personal and intimate relationship with Him.